First up we have Abzan Midrange, led by old friend Courser of Kruphix and new friend Siege Rhino. Do you like big value creatures and hitting your opponent in the face? This is the deck for you! Next is Jeskai Tempo Aggro Burn Wins ALPHONSO! No one knows quite what to make of this deck. Is it a burn deck? Is it aggressive? Controlling? All of the above? Whatever it is, it's good. Do you like Izzet? Do you like Boros? This deck combines both in one tasty package. UB Control - what no new clan? Lame. Control, it turns out, did survive Rotation, but only just barely. Dig Through Time is no Rev, but still incredible. Perilous Vault is no Verdict but.... Ummm... it still... does stuff? We still have Counterspells! Disdainful Stroke is the new hotness! Jeskai Ascendancy Combo - yes there is a REAL COMBO deck in Standard. Hard to beleive, much doubted, but here it is. Pick your wincon and combo out. Images and more details to come. Just wanted to get a thread up. UB control looks miserable. It looks miserable when it's losing and it looks miserable when it's winning. The only time it doesn't look miserable is when it casts dig through time or ingenuity, then it resolves and you get more terrible cards in your hand and it looks miserable again. My favorite part of coverage was the anecdote about someone talking to Floch about his chance to win two Pro Tours in a row and he just said, "not with this deck." Mardu midrange or bust get out ye homps. Nah, Alphonso is the nickname for what people will call "Jeskai Tempo" or "Jeskai Wins", which are terrible names compared to Jeskai Alphonso. the "control deck" is terrible and it doesn't even have anything good or powerful to be doing. you know what's better at control? the abzan deck, just raise the top end. basically what ari lax was doing. Yeah I just don't think UB Control is for real. It's just... ugh... I mean yeah, a version bad top 8, but Perilous Vault is just so awful and slow. Of the top 8 decks, I actually think it's the worst choice... even behind Combo. There's just so little card advantage to be had. Dig through Time is amazing, but the thing that really separates it from Rev is that, while only UWx Control got to run Rev, UB Controls' OPPONENTS can run DTT too. So the inherent advantage of having access to stupidly good draw spell just isn't the same when Jeskai Alphonso gets to run it too. And is faster. Also better. Pearl Lake Ancient and Prog Sphinx are just no substitute for AEtherling/Elspeth either. It's just hard to see where the card advantage Control desperately needs is coming from, other than Dig. White gives you End Hostilities, but it's also slow and unlike the even slower Vault doesn't answer Sarkhan, Nissa or Elspeth which are all things that are very dangerous. Black feels bad because while Heros Downfall and Thoughtseize are sweet, in a format with Abzan Midrange and Jeskai Alphonso I don't think Control can really afford to go 1-for-1 without a better way to restock. 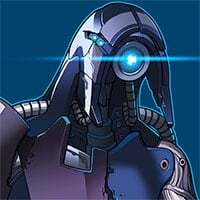 Maybe new Jace is worth investigating? It can fuel Digs, and draw you 7 if you ultimate... but again it's so much slower. My gut says Control will be born out of a variant of Alphonso. I feel like the tap out esper version with end hostilities, ashiok, and elspeth is better against the field of midrange and jeskai decks, but that version probably gets wrecked by the straight u/b draw go control deck. 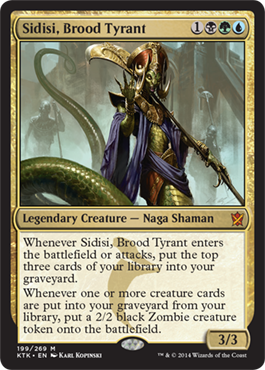 I want to pair new Jace with Sidisi. They're going to be best friends and make lots of zombie babies. 'twas a little sad to see no New Jace at the PT. Also, why are Temple of Malady so damn expensive on MTGO? Isn't it like a one-of in the Abzan decks? They were pricey because of all the black devotion deck splashing for Abrupt Decay and Golgari Charm, and now it's reversed with green devotion decks and Doomwake Giant. Plus they're from Journey, which was opened less than Theros and Born, so supply is a little tighter. Hey, I used the proper name in the OP, sir. What if I just played five color good stuff, but in Standard. Oh, that's just Abzan? Damn. "Sorin is only good for life gain"
I mostly agree with you! But they're both super good so it kinda doesn't matter. Also I can't stop pulling fetches. At least twelve so far. But not a single wooded foothills? And only one polluted delta that I immediately traded to a guy that was standing right there and really wanted it. My first prerelease I got a Sorin and a Flooded Strand, got a fat pack yesterday? Sorin and Flooded Strand. I am perfectly ok with this turn of events, I'm getting a box tommorrow and it should be interesting. I have pulled trash ever since my Bloodstained Mire on release day. Even the fetch I got is the worst one. I swear, I don't really buy boxes or packs, but I draft and win 2-8 packs every week and my trade binder has maybe 7 cards that are worth $10 or more.